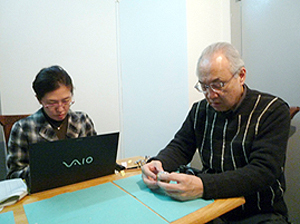 As part of a program for cultural cooperation by the Japan Foundation and scheduled from Nov. 27 to Dec. 6, 2011, a survey of Japan-related artworks in the collection of the Azerbaijan State Museum of Art was conducted. Azerbaijan became an independent state following the collapse of the Soviet Union in 1991. Its capital, Baku, is located on the western coast of the Caspian Sea, and medieval buildings that have been inscribed as world heritage sites still remain in the older part of the city. 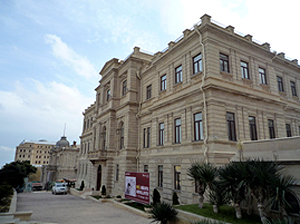 The Azerbaijan State Museum of Art was founded in Baku in 1920 and curates and domestically exhibits primarily Russian and European paintings and sculptures. The Museum’s collection includes about 300 pieces of Oriental art from Japan and China, but the Museum has no expert in Oriental art, so the Museum has had difficulty distinguishing Japanese artworks from those made in China or elsewhere. Thus, OCHI Ayako, a member of a culture team in the Cultural Programs Division of the Japan Foundation, KOMATSU Taishu, Director of the Akita Senshu Museum of Art, and EMURA Tomoko of the Institute visited the Museum. We surveyed works in the collection and advised Museum personnel on exhibiting and managing those works. As a result, the survey determined that about 100 of 270 works that were surveyed were Japanese artworks (pottery, sculptures, lacquerware, gilded objects, textiles, paintings, and books printed from woodblocks). Most of the surveyed works are pottery exported overseas from Japan and China from the late 19th century to the early 20th century; although the pieces are not considered particularly rare, the identification of this collection of exported pottery is significant. Plans are to finish compiling the survey data and then translate the survey report and provide copies to the Museum. This effort should help to further understanding of Japanese culture in Azerbaijan and help locate unknown works held abroad as part of research on pottery exported from Japan. While in Azerbaijan, we visited the Embassy of Japan in the Republic of Azerbaijan and met with WATANABE Shusuke, the Ambassador Extraordinary and Plenipotentiary. The Ambassador explained that he wanted to build on the survey and encourage further cultural exchanges between Japan and Azerbaijan. The efforts of Embassy staff like KOBAYASHI Ginga, second secretary to the Japanese Embassy and supervisor of this program, helped to ensure our survey went smoothly overall. The year 2012 will mark a 20-year milestone since the establishment of diplomatic relations between Japan and Azerbaijan. Plans are underway for the Museum to host commemorative exhibitions with the cooperation of the Japanese Embassy. The survey was extremely significant since it laid the groundwork for future activities like plans for friendly relations between the two countries.